The debate on the N-word is one of those things that I am definitely torn on. On the one hand I understand where the people who say that the word is a term of endearment are coming from, but then on the other hand I also understand where the older generation is coming from when they say that the word is evil and can never be meant for good. I mean really this is one of the only words that I know that is drenched in blood. Can we ever really wash away the blood that has been spilled due to this word? I for one am trying to decimate this word out of my lexicon, but it has proven to be harder than I thought. I know it will take a conscious effort on my part to achieve my goal, but it sure isn't easy. Let me know where you standing and whether or not you are struggling with this dilemma as much as I am. I can honestly say that I'm definitely not torn on the word anymore. I'm definitely on the side of we shouldn't be using it at all. I can't say that I've completely eradicated it from my lexicon (trust me, old habits die hard), but I'm defeinitely making a conscious effort to move away from it. 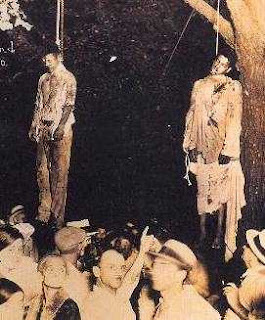 The fact that my grandfather was almost lynched and ran out of Lake Butler, Fl when he was a young man is enough to make me want to stop using that word. Trust me, they weren't referring to him as 'Mr. Black Man' while they were coming after him in their sheets with their shotguns. I have to think about what it does to him when he hears his grandchildren using the same word that almost got him killed. can we ever clean that word and make it pure. It's just not possible. I, too, decided to stop using the term years ago. I rarely used it then. I feel the same way about the b-word for women. Some people have decided to make it a term of endearment, but there is nothing endearing about it. Folks have rationalized the idea but to me it's very dysfunctional.